The Tirocchi sisters' shop was located in a late Victorian house at 514 Broadway. Known as the Prentice Mansion, it was graced with a mansard roof, oversized "sunburst" gables, and an ornate Italianate tower, and was built in 1880 for George W. Prentice, who began his working life in Providence as a tailor, appropriately enough. By 1880, he was treasurer of the Heaton Button Fastener Company, and by 1895, president of the company. He later became president of the Whitney Pearl Company and the Providence Wire Nail Company. 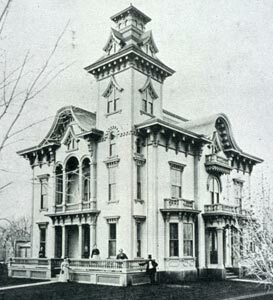 Prentice died in 1914, the year before Anna Tirocchi purchased the mansion.